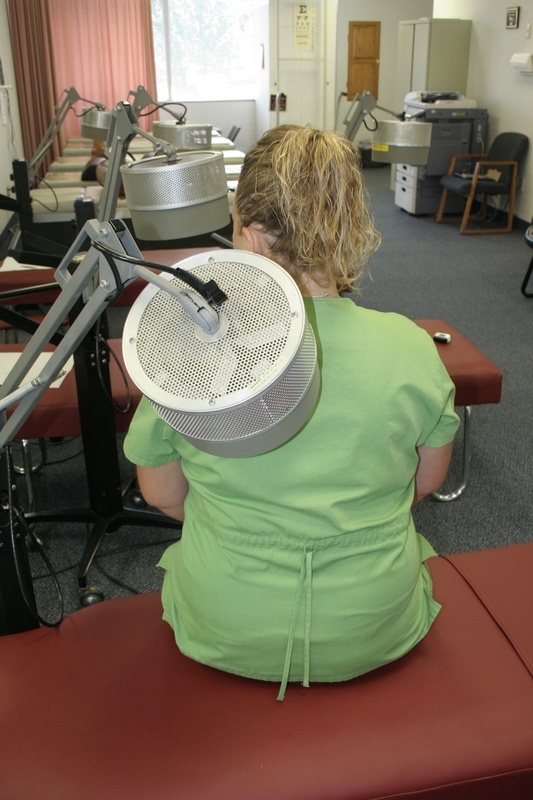 Shortwave diathermy emits comfortable heat by generating an electromagnetic field which brings soothing relief for many patients suffering from back pain, spasm, bursitis, arthritis, and other musculoskeletal conditions. Unlike a heat lamp, heat pads and oily ointments – the diathermy energy field passes through the softer tissues near the surface of the body. As it penetrates into the more dense tissues below the surface it turns into a soothing heat that increases blood circulation and can help speed in the healing process. It should feel pleasantly warm, but not hot. For instance, with an injured or inflamed joint such as sprained knees, hip, back, or frozen shoulder, the treatment objectives are to relieve pain, prevent stiffness, and restore restricted movement. Diathermy is frequently the most effective means for accomplishing these goals because the deep heat relieves the pain, relaxes the muscle fibers, and permits easier movement. Diathermy also has a soothing and relaxing effect on the type of muscle spasms and contractures often seen in low back pain, rheumatoid arthritis, and some spinal disc problems.